for more photos and stories about the quilt repair process. 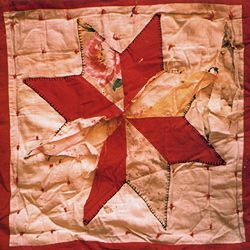 "Thoughts About Repairing Antique Quilts"
"There is a Mystery in Every Antique Quilt: This American quilter brings the story of these precious things to life again." Feature article. By Dorothee Crane. Quilt- & Textilkunst Patchwork Professional, Germany. January 2018. In the professional conservation world, a distinction is drawn between restoration and conservation. "Restoration" is also often referred to as "repair". 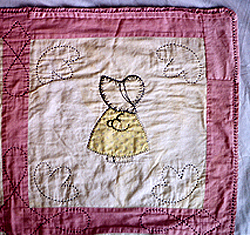 A quilt is restored as closely as possible to its original state by replacing or fixing damaged or worn places. A quilt that is lovingly and thoughtfully repaired adds another chapter and another set of hands to its story. It's a good idea to keep a record of the repairs so that future owners can understand the quilt's history. Professional conservators tend to dislike restoration for a number of reasons: Restoration lessens the historical integrity of the piece, i.e. a restored quilt is no longer exactly the antique it once was. In addition, restoration can lead to confusion, both for present viewers and for future researchers, as to what is original and what has been patched. And importantly, restoration can be dangerous to the future life of the quilt. By definition, "repair" makes an object useful again. And putting a quilt back into the context of use that has already damaged it can only mean that the wear process will continue on the next set of weaker fabrics. It's important to understand that a repaired quilt is not as-good-as-new, but is still an antique with lots of weak fabrics. Worn patchwork pieces covered with new fabrics. Burn hole reconstructed with new fabrics and batting, and requilted. Missing batting, fabrics, ties and embroidery replaced. 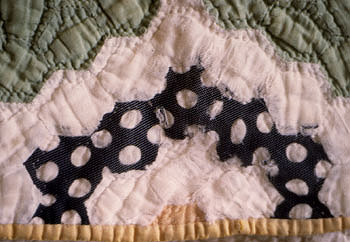 "Conservation", on the other hand stabilizes and maintains the current condition of the quilt. 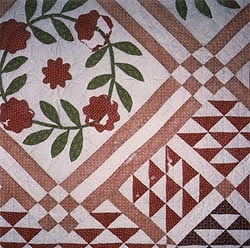 The only fabrics added to a quilt are those that give necessary structural support. Conservation processes protect and keep even the worn places, as past use is also part of the quilt's history. 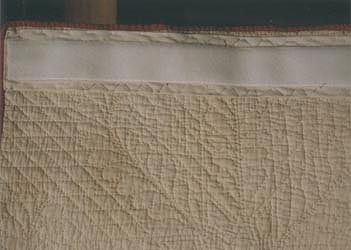 The use of sheer fabrics to cover and protect areas of worn fabric means that visual "neatness" takes second place to maintaining the historic information embodied in the quilt. Conservation processes take into consideration, not the short term use of a quilt by the current owner, but the preservation of the quilt as an historical document, the maintenance of the quilt into the centuries ahead. Worn silk with cotton underlay and sheer fabric covering. Cotton covered with almost invisible tulle netting. Pictures and a description of conservation on a spectacular and historically important mid-19th century quilt. I've put the process of evaluating a quilt into an equation. Weigh the four points on the left together to come up with the direction you will take. 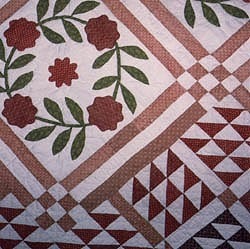  Quilt restoration or conservation is tedious business. In general, you can figure on averaging 3 patches per hour, including both locating the fabrics and doing the actual sewing. This varies from quilt to quilt according to size of patch, type of fabric, amount of quilting, and so on.  Distinguish structural problems (e.g. holes or tears all the way through the quilt) from wear (e.g. disintegrated fabric). Mending structural problems is usually more urgent, and also takes longer per mend.  Separate patchable places in three categories: eyesores, worn, wearing. "Eyesores" are patches totally missing, patches with torn fabric hanging loose, holes through all layers of the quilt, i.e. anything that I can see without my glasses. 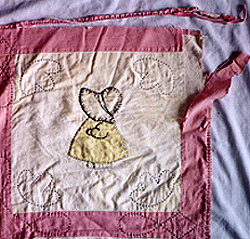 "Worn" are patches where the fabric is mostly all still there, but is torn and batting shows through. "Wearing" are patches where the fabric is obviously very weak and will not last much longer. The longer you look at a wearing quilt, the more wear you will see, guaranteed. 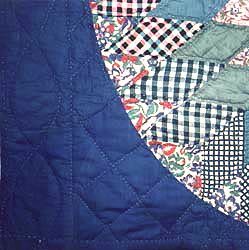  If you are planning on hanging the quilt, all possible repairs need to be done along the top edge which will bear the weight of the quilt. Plan your time budget for the rest of the quilt from there.  Consider how the quilt is apt to look when the job is done. The newly applied fabrics will never be exactly the same as the original fabrics. Restoration work done on a quilt with only two or three fabrics will be relatively obvious, while repairs to a scrap quilt tend to get lost in the busy-ness. The older an antique quilt, the less likely a newer fabric will blend in well.  Is this a family heirloom?  Is this an antique quilt with an exciting collection of vintage fabrics?  Are there embroidered or inked inscriptions?  Is this a museum-quality, or otherwise exceptional, quilt? 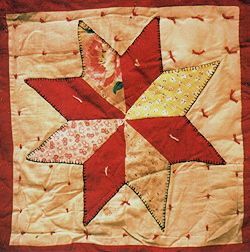 • All quilts hold some historical value, utility quilts included. Consider an otherwise unexceptional quilt that has survived 150 years - its value now resides in the fact that it avoided being "used up". 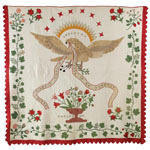 Family quilts with known maker and provenance have even more historical value. Consider your answers to these questions, and then consider how much you want to tamper with that historical record.  Does the monetary value of the quilt have any part in your decision?  Is the sentimental value really what is important to you? 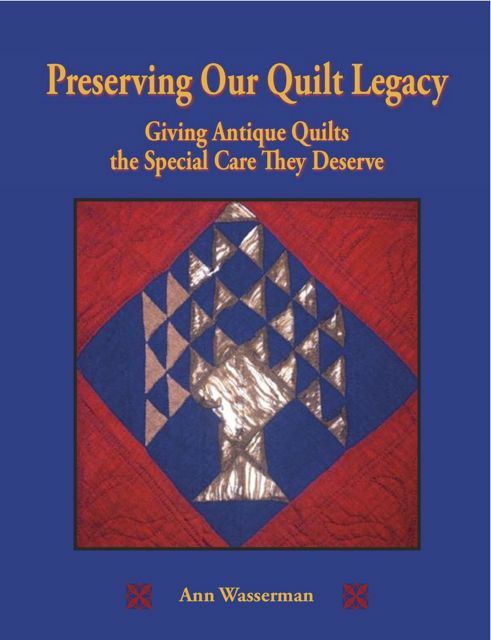  I am often asked whether repairing a quilt increases or decreases its value. 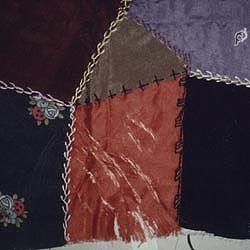 At base, the value of the quilt is already lowered, with or without repair, just because it is no longer in fine condition.  If you want to hang the quilt, determine if it is strong enough.  If you want to display the quilt, determine how worn a quilt can look and still appeal to you as a decorative piece in your home. 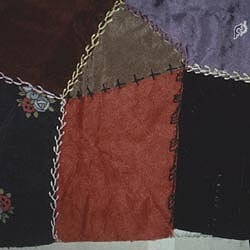  If you want to continue using the quilt, remember that putting a repaired quilt back into the same context will generally lead to the need for more and more repairs down the road. You will either run it into the ground, or by continuing to repair it, you will, in essence, no longer have an antique quilt. Velcro strip sewn to quilt back for display. 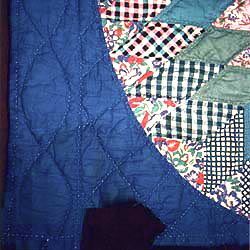 Washing old quilts is very stressful for aged fibers, and generally not recommended in the home. Conservation labs have complex equipment and procedures to ensure the best results possible. Even so, washing is always somewhat unpredictable due to the many unknowns of fabric dyes, stain identification, water quality, etc. Stains, which have been in the fabric for decades, and yellowing, which is a function of age rather than dirt, are not likely to disappear anyway. Spot stain removers, commercial dry cleaning, and agitation in a washing machine are all strictly contraindicated. All these are pretty much guaranteed to do more harm than good. The only time I feel comfortable recommending washing is when the soil is so bad that it is obviously damaging the fabrics or making the quilt otherwise too unpleasant to use or store. Otherwise, the safest cleaning method is vacuuming, done with the protection of a piece of fiberglass screening (rough edges covered with twill tape) or cheesecloth (attached to vacuum nozzle). This avoids all contact with water and soaps, while removing dust and generally freshening the quilt. If you are considering washing your quilt, I recommend following at least these basics for safest results. Full, detailed instructions can be found in my book. • Handwash in the bathtub. Do not dry clean. • Use a mild soap without whiteners, softeners, or perfumes. Orvus is often recommended by conservators. Do not use Woolite. • Rinse at least 6 times. Then, spin in the washer (don’t agitate!) to squeeze out excess water. • Lay flat to air dry on a plastic drop cloth. Flip regularly. Use a fan in the room to circulate the air. Contact me, Ann Wasserman, at annquilts@comcast.net. If you'd like, you can start by sending me a couple of photos, preferably one of the entire quilt and a few details. Also, please tell me the approximate size of the quilt, and what answers you may have to the above questions to begin our discussion. I can give you a general assessment via e-mail. I have over 30 years of professional experience in quilt care and restoration. Services offered include: reconstruction of holes, patches over worn fabrics, replacing missing quilting or embroidery, preparation for display, vacuuming, and very occasional washing. I can work on patchwork, appliqué, crazy, and embroidered quilts. I may be able to give you my opinion and a rough estimate via e-mail, but I can give a firm estimate only when I see the quilt "in person". I'll ask you to send the quilt, along with the return shipping fee. We can then discuss the estimate and answer any questions you may have. If you decide not to go ahead with the repair, I'll send the quilt right back. I also offer a workshop on quilt repair philosophy and techniques. A description of the "Care and Repair of Antique Quilts" workshop can be found on my Lectures and Workshops page. Website created and maintained by Ann Wasserman. Contents of this site may not be reproduced without permission. All artwork, electronic images, and text are copyright ©2019 by Ann Wasserman.